I finally got a look at BP’s Statistical Review of World Energy, which has actually been out since June. There’s a lot in there. BP notes that the growth in world energy consumption fell to 2.5% in 2011, compared to 5.1% in 2010. They also note that 71% of the growth in energy consumption was in China. 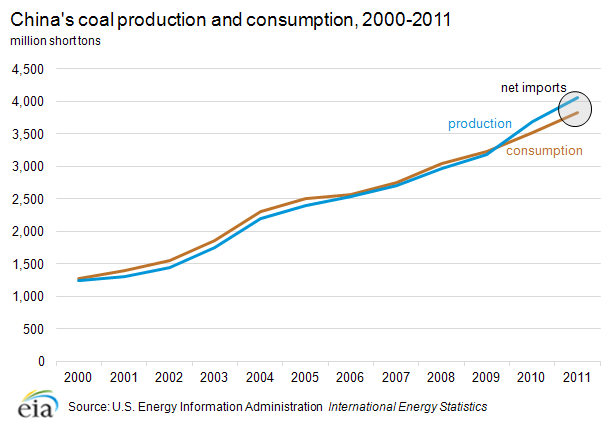 Worldwide use of coal increased by 5.4% in 2011. China’s use of coal grew by 9.7%. China dug out half (49.5%) of all the coal used last year. They also imported a lot. 185 million tons last year. That’s projected to rise to 1 billion tons by 2030. That’s a lot of coal. It’s worth another look, especially as the DOE EIA has published a new country analysis on China and energy. The Chinese economy, as I predicted, will start to struggle and even sputter at times between now and then. But if the history of other developing countries is any example, that won’t affect energy consumption nearly as much as one might think. In the United States, that Great Depression? Didn’t affect our energy consumption curve. That’s a lot of coal. One good way of looking at weather in the developed world is by looking at energy consumption. It tells you how much air conditioning people are using in the summer and how much heating they’re willing to pay for in the winter. Last year Japan was patriotically conserving energy, as they had shut down most of their nuclear generating capacity because of the Fukushima earthquake/tsunami, and hadn’t yet figured out how to replace it. So the fact that power demand rose 2.1% in August compared to the previous year is not a big deal–Japan is importing lots of oil and it’s a rich country. However, in developing countries such as China, variations in energy consumption have more to do with economic conditions than responses to the weather. China’s energy consumption between March and June grew by ‘only’ 5% per month compared to the same months a year ago. This caused great concern amongst China watchers. They don’t believe China’s statistics about the economy, so they watch energy consumption as a useful proxy for what is happening in the larger economy. Energy consumption in the United States is, well, interesting. We keep better statistics than most places and can say things about our energy consumption that other countries cannot. In May 2012, for example, the U.S. consumed 7.675 quads, slightly up from May 2011’s 7.609, but slightly less than May 2010’s 7.678. I’m looking at this because I’ve been reading discussion about hot summers and their causes (is it climate change, natural variability or some combination of the two). Since 1949, the records for highest demand for each month has been 1978 or earlier, with the exception for December, when the record was 1989. There is lower demand for heating in recent years than previously measured. This tracks global warming theory–the number of very cold days in winter has been expected to decrease. However, the records for lowest demand for each month has only 3 of recent vintage–November’s record for lowest demand was in 2001, January’s in 2006 and March in 2000. Two records were set in the 50′s and one in the 60′s. Recent years have not been uniformly warmer than those in the modern record as measured by the DOE. Interesting. Cooling degree days use a similar metric to measure demand for energy for air conditioning. The Department of Energy also publishes a record of CDD’s from 1949 through 2010. Here the data shows that recent years have been warmer in the U.S., with record high demand for 5 of the 7 months measured being recorded in the past decade. See: http://www.eia.gov/totalenergy/data/annual/pdf/sec1_18.pdfMost of the records for low demand are relatively ancient, with the most recent record low month being 1992. It has been getting warmer recently. But it doesn’t seem to be happening according to plan. Global warming theory has been clear that it should be happening primarily in the winter months. Explanations or educated guesses are welcome.